The bulk of the storm passed me in the night (I’m the pink dot to the lower left). 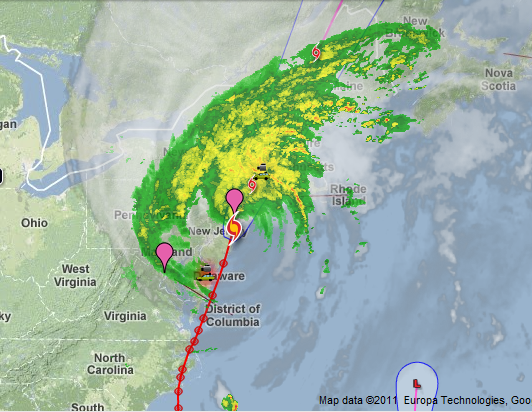 The eye is now is now sitting on top of New York (the pink dot to the upper right). Right now in DC we’re only getting a light rain. It feels very calm and ordinary after yesterday’s stormy energy. The forecast calls for clear skies and lower humidity as early as this afternoon. I’ve been fortunate to escape the power outages. The Washington Post reports that more than 1 million people in the area are without power, including about 124,000 in my immediate vicinity. My hurricane report isn't nearly as exciting… It's cold and rainy. 68 degrees in my house (guess I'll be doing some baking for dinner) and not a lot of wind. You feel like you're missing the party… I feel like I wasn't even invited.